Styled with dax longsleeve and rosemarie pant . See this in Alpaca-Wool or Wool-Cashmere Blend. It’s was a wonderful coat but too big for me. Very good material, warm and soft. I bought the grey coloured coat 2 years ago and wore it all through the fall, part of winter and spring and just bought the camel colour. 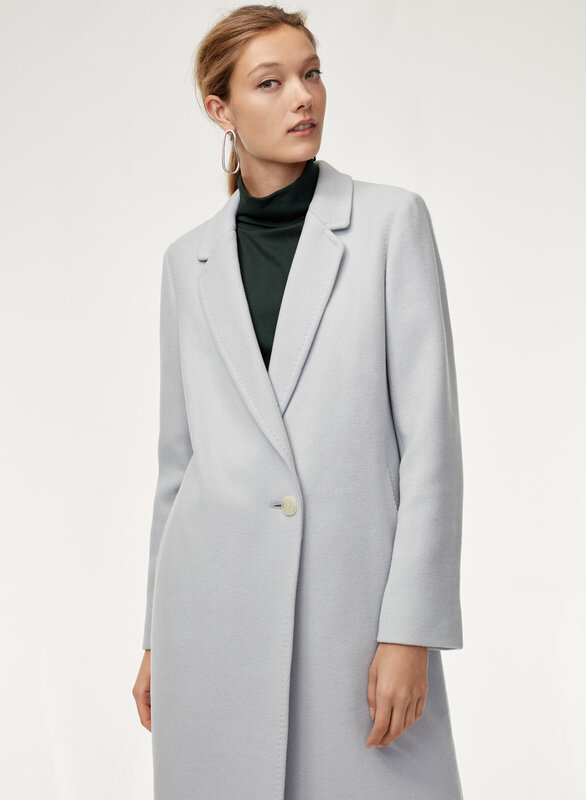 I’ve seen cheaper similar coats but they’re just not nearly as nice as this one...it’s the precise material and cut that makes it timeless and a staple piece in my wardrobe. Tailored fit, and bright sunny colour. I receive compliments each time I wear the coat. 5ft2 105lb I sized up so I can wear a chunky knit sweater underneath. Super soft, and beautiful. Really glad I made this purchase! Fits a bit bigger. Love the minimalist, formal look. It's classic and beautiful. The arms were too long. Even though I’m a small the coat didn’t fit right around my hip area. Lovely coat, but the fit was off on me! I’m pretty short (5ft) and found the length was awkward, and the sleeves were way too long. I really like this coat. It’s soft and warm. It’s long and slightly over-sized. I could have got the extra small for a more snug fit, but like the look of it being a little bigger. The fabric and construction of the coat is really nice. Feeling fancy everytime I wear it. Love the material. Could be a little bit warmer. I should have listened to all the reviews' recommendations to size down. All my Aritzia coats are smalls, as are all my Aritzia tops. I decided to try the Stedman in small but it was much too oversized for my liking. I exchanged it for an XS and now it's the fit I was hoping for. So yeah, SIZE DOWN. The downside is the sleeves are now on the tighter side, but I'll take it over the whole coat being too big. As others have recommended, this coat should be fully lined. 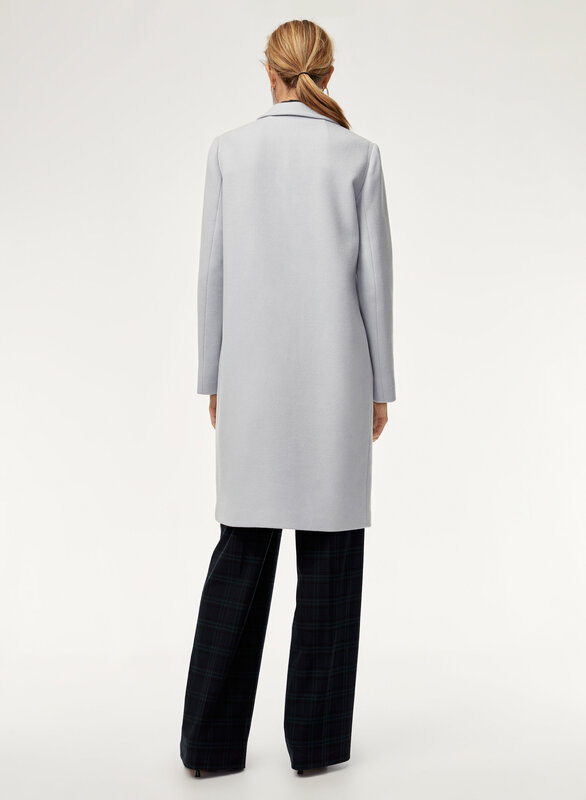 All my wool Aritzia coats in this price range are fully lined, so I'm not sure why the Stedman isn't. I hope this adjustment is made in the future. For further reference, I'm 5'7 and 145 pounds. It’s a little loose but this is the style. The arms were a bit long on me which seems to be the case on most XXS aritzia wool coats. 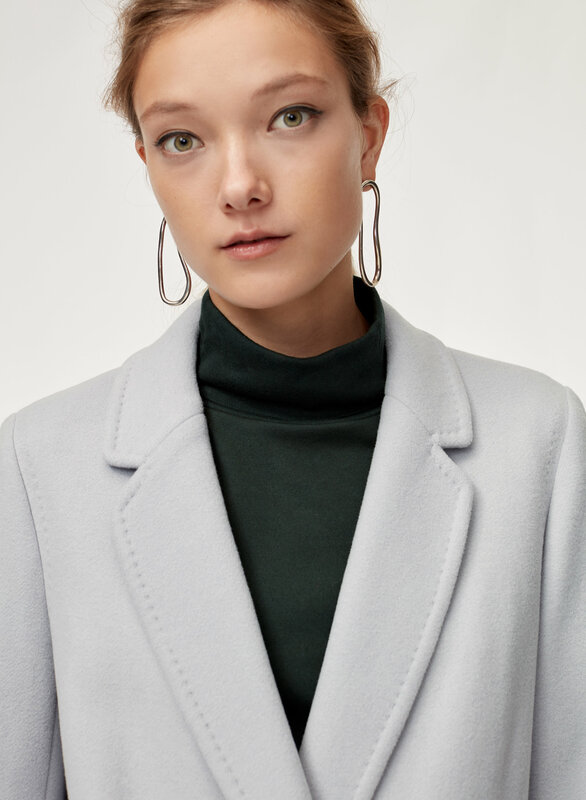 I purchased this in the Heather Charcoal as a transition coat because I wanted a color that I could still wear on the colder spring days. It does not disappoint! I think I've worn it nearly every day since purchasing. It has a great casual yet put together vibe that pulls any outfit together and it's structured without being too formal. 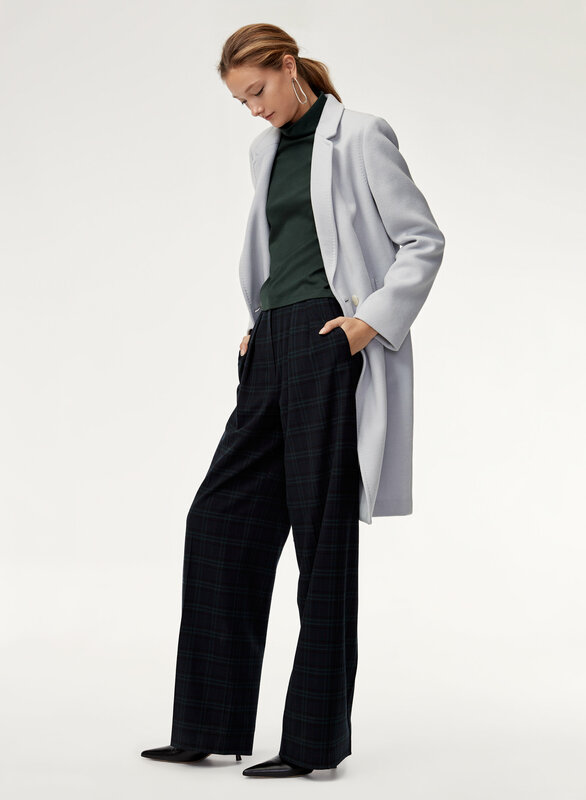 The length is spot on for me (5'7") and I like the slightly oversize blazer look it gives. The only downside, like many others have said, is that the inside isn't fully lined and I would love to see a wool version that is fully lined (besides the alpaca version). That being said, it isn't the warmest coat in my closet but it's perfect for cold days and has enough room to layer thicker sweaters underneath. I really love this coat. After much deliberation I finally went for the pink. It’s a beautiful colour and will look great for spring. 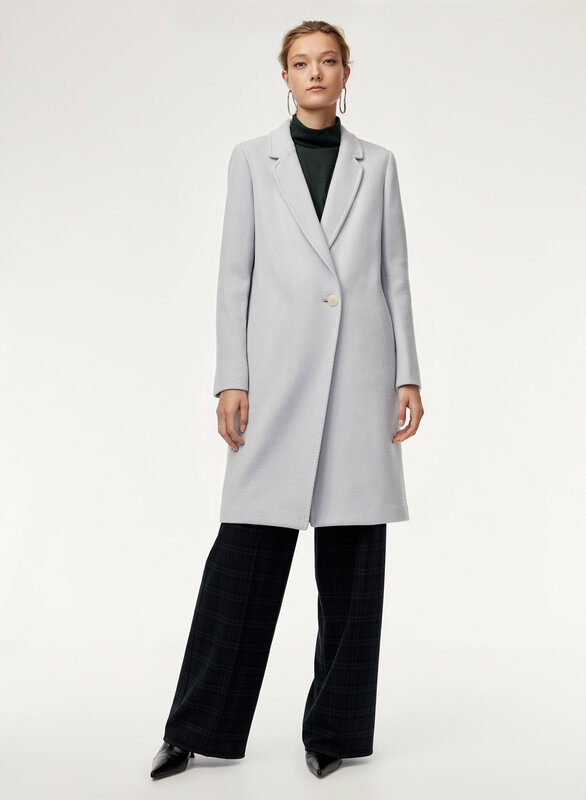 The only thing I would like to see added to this coat for next season would be the addition of a lining and a back pleat. For those wondering - Initially I almost ordered in the Habano colour, but the salesgirl talked me out of it when I tried on Savile in store and I bought that one in XS instead. However, I wasn't in love with the Savile colour as it seemed to wash me out, and still felt the coat was too large even after sizing down from my usual S. I happened to come across the Habano colour in store when I was traveling and it is the perfect warm brown that's on trend right now. I feel like the pictures do not do it justice, IRL it's not orange, it's just a gorgeous, aptly named warm cigar brown. I also ended up going with an XXS in Habano as the coat isn't lined and I realized I wasn't going to be wearing it during thick sweater season anyway. I would advise sizing down at least 1 size and two if you have narrow shoulders and are 5'5" or under, as the XXS hits right at the knee on me and is much more flattering. Both Savile and Habano are gorgeous - I would recommend the former if you're blonde, have olive skin tones, or want a coat that pulls more yellow in indoor lighting, and Habano for those with pink undertones. Habano is actually brown, whereas Savile is more of a tan colour. Hope this helps! Loved this cost. Color, softness, style. Beautiful coat. I love this coat! It looks super cute dressed up with a skirt and heels, but also awesome with sneakers and ripped jeans! It’s very comfortable and warm and has a nice fit! I could have purchased an xs but I wanted to be able to wear it with a nice oversized hoody! So the small is perfect! I love my stedman coat but I just wished the body was lined so that it’s a bit more refined and warm. The sizing does seem a bit large (I’m wearing a size xxs when I usually wear xs in their coats) but I think it’s to accommodate layers should you want to wear thick sweaters underneath.I still love it though. I bought this one in Salish color and a size S. I usually wear size XS but go with size S for outwears. I'm 5ft6 and 120 lbs. Size S is slightly larger on me and can easily fit all my boxy sweaters. Salish color is like icy pale blue, very stylish. Love the style of the coat, something you can wear forever! Wish it was lined through the whole coat and not just the arms. I originally ordered a small and it was way too big, exchanged for an xs and fits much better! I love my stedman jacket! The fit and colour are amazing. I had a hard time choosing the colour online as they didn’t have my size in the colour I wanted in store. I ended up going with the light tan (I wanted a darker tan colour). I was nervous it would be too light, similar to a spring trench coat colour, but it ended up being exactly what I wanted. It looks much lighter online then it actually is. My only con is it is not as thick as I thought. My friend bought the Joshua coat and it is much better suited for Canadian winters. That being said I will be able to wear it in fall and it won’t be too thick. Also, getting the label off the arm was not easy and left little holes. I am usually a small in most stores, but often an xs at Aritzia. The xxs small fit me, but I went with xs so that I can wear a hoodie underneath. It is still fitted in xs. The small was too big on me. Next winter I will likely buy the Joshua though and keep this for a fall jacket. The coat runs small. I ordered the size I thought I’d need but it was too small in the arms and hips. Classic piece for any wardrobe. It took me 6+months pull the trigger and buy this jacket. I’m supper happy I did, and for the sale! It looks great dressed up or down and fits true to size. I bought the bright tan colour and love it, it goes with everything I wear. The only thing I might consider is adding two darts in the back, this is because I have a rather curvy backside and I think it’d create a slightly more tailored look from behind given I’m an hour glass shape. It’s a beautiful jacket that is very good quality. 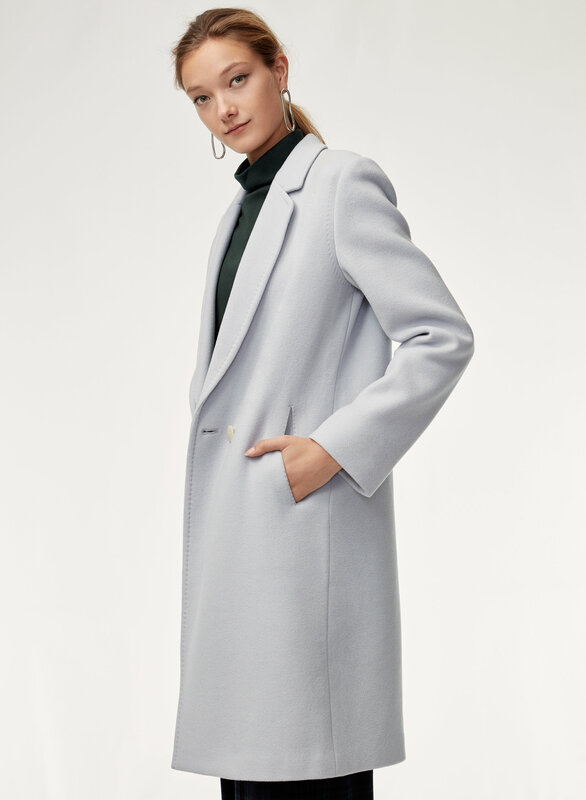 This wool coat is made very well and seems to fit very true to size. I had to go in store and try a coat on before I bought. Style was a bit big and looked better in taller woman. Ended up buying xs. Love the coat, just slightly bigger than I expected. Absolutely love the style and and fabric, but I ordered my usual size without trying it on in store, and find that I wish I sized down. Its a lovely coat- not too thick or too light. Easy to layer. Having said that I thought this coat would keep its structure a little more. It seemed to wrinkly if I put it down somewhere. Not sure what that’s about especially for the price point- surprising. 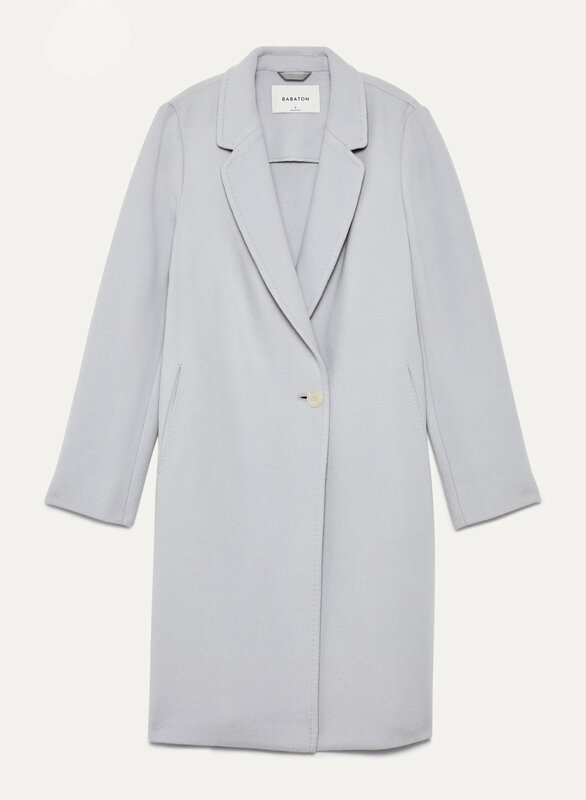 This is such a lovely coat! It works so well with both casual and dressy outfits. The only thing that I'd change would be to add lining to the entire coat, not just the sleeves - I get chilly in this coat if I don't wear a scarf on top! Beautiful colour (Saville) and soft coat, but wished there was an extra layer of inner lining. Fits a little bit larger than normal, but makes for a nice oversized look. Very satisfied with everything! I’m typically a M but this was too big. Loved everything else about it. The fabric is amazing! Love this coat. Usually a small or medium, got a medium as I wanted it looser fitting so I could wear sweaters underneath and it’s perfect. Might need another colour! I love this coat. It is the perfect weight and perfect fit for over sweaters and dresses. I purchased a size small in pink and have had many compliments. It’s true to size. I love it but only problem there is no lining. I’m 5.4 and 123 lb. This is a beautiful coat! However, I thought the color was cream and it was pale pink. I am not really a pink person so I returned it. I will be on the look out for another color though as I loved the coat! Perfect camel coat! It elevates every outfit to cool, casual chic. I love this coat! The fit is great and very flattering. The length is also great. Only reason I gave it 4 stars instead of 5 is because I wish it was lined. Would recommend sizing down on this one unless you have broad shoulders. Fits and looks great. A timeless piece to add to any wardrobe. I love this coat! The fit is great and very flattering. The length is also great. Only reason I gave it 4 stars instead of 5 is because I wish it was lines. Would recommend sizing down on this one unless you have broad shoulders.